Bear with me while I “toy” with you for a while. The stick horse has long been a traditional American toy, especially enjoyed when we were kids by those of us past our Chiron Returns. There’s the stick version and also the hobby horse or rocking horse. In honor of mythical Chiron’s lower horse half, I want to talk about how this archetype permeates our consciousness from the time we can barely walk. How this relates to Chiron: Chiron was a great teacher and mentor of heroes. The heroes in Greek mythology were the ultimate adventurers. Chiron oriented his heroes in training by helping them build skills for the quest, and that’s my goal in the Thrival Kit series. Cowboys on horses are the American version of Chiron’s students, a far cry and distance from Hercules, Jason and Asclepius. Unfortunately, except for the child’s tendency to love to play doctor and play with doctor kits, there isn’t a healer link to Western heroes or a prep school for the Wild West in us. The horse/human merger idea is there, but the dots aren’t connected to all Chiron is or was in his full archetypal meaning. Imagine if they were! Our instincts for adventure and riding with the wind in our hair are absolutely right on. What we need is a little shamanic orientation, to bring in the sacred healing dimension to our wildness, rather than killing the natives or taming the wisdom and talent out of them. Imagine the town Doc confabbing on a regular basis with the local tribe’s medicine man—that your walk on the Wild West side would have the tenor of the realized Chiron archetype itself, an opportunity to develop your embodied spirit. 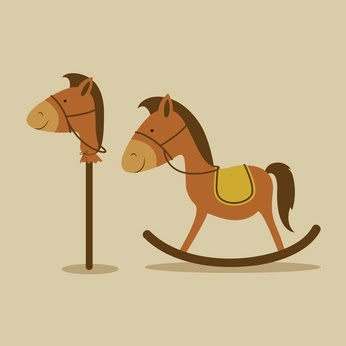 It’s no news that I think Chiron requires a sense of humor, but taking the hobby horse image a step further: Chiron asks your childlike trust and excitement. There’s nothing like seeing a wide-eyed child encounter an experience for the first time, whether it’s taking his or her first step, blowing bubbles, or witnessing rain. After all, Chiron’s students were children on the cusp of adulthood. 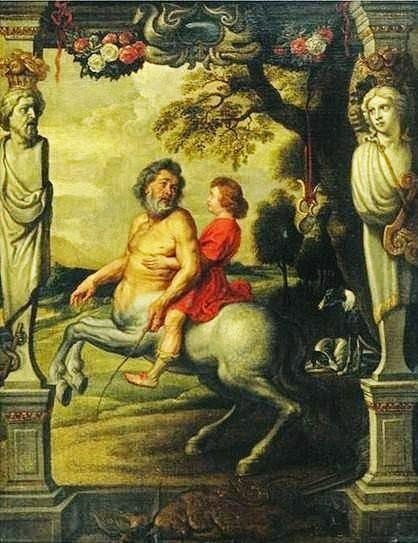 Like the composite centaur being he was, Chiron taught people in their transitional state, morphing from one era of life (childhood) to another (adulthood). The hero’s journey is a coming of age story. Chiron asks us you to grow up in more ways than one. We never want to lose the gifts of one state to the other but to bring along the best of the past and incorporate it into our present—which quickly evolves into our future. That’s why Chiron, the planet, orbits between Saturn (Old) and Uranus (New). Chiron’s teachings are best learned with the eyes of a child and the heart of an adventurer. Chiron asks you to trust discomfort as your teacher and stuckness as a hint: You can go no further until you get through this barrier. If you’ve got images of your Chiron’s horse half jumping over hurdles like a well-trained circus performer, think again. This isn’t a trick horse. It’s not about jumping the barrier but getting through it. That means getting smack into the middle of it where you’ll find both its gifts and the medicine to minimize the pain. What’s behind some of those pains are incidents and feelings that are often hard to face, but the way this treasure hunt is set up, you will keep being sent back to them until you open Pandora’s pain box and face her squarely. Get help, if needed, to handle whatever jumps out. Help may be another thing you resist. Again, take a page from a child’s book. You fall. You hurt yourself. You take yourself and your boo-boo to your mama for nursing and comfort. You still get to do that as a grown-up, only the helpers come in other various shapes and sizes: friends, family, therapists, healers. Being stuck is often pain in disguise. You don’t want to feel it, so your subconscious sets up roadblocks. No progress until you go back to the pain and work on its source and how to release its hold on you. Refuse to live a life in agony or in suspended animation. Refuse to let the stuck place rule you from your subconscious. Find out what needs to be faced and face it, so you can finally move on. Cue from a child: Pitch a fit. It wasn’t until I had screaming conversations with All That Is, refusing continued misery that the heavens opened and beamed in help from all directions. This is the ultimate ask for help. Astrology readings – Chiron was the first astrologer and surely used natal charts to help his students find their talents and needs for further learning. Tarot readings – The technical term for tarot reading is chiromancy, a word that shares the same root as Chiron, referring to the hands. Tarot is a form of hands-on healing, as the energy transmitted between reader and client are carried through both pairs of their hands and the cards they handle together. Acupressure Acupuncture – See Chiron and Chi for details. Qigong or T’ai Chi - See Chiron and Chi for details. Music. Songs about pain and healing are naturals for Chironic times. An important phase of healing is first feeling and allowing the pain to express itself and to share its messages with you. This is different from long-term wallowing. It’s a step in a process, not a destination. As I started to explore this topic, I realized there were lists out there that encompass far more than my own taste in music. For instance, 10 Best Songs About Pain and Entertainment Weekly’s 50 Most Heartbreaking Songs of All Time. When I look back on being single in my twenties, my love life was one heartbreak after another, because I was too young to know what I was doing in a new world that suddenly offered a lot of freedom and optional responsibilities. I knew even less how to handle then-current Pluto/Uranus conjunction in Virgo and its personal effects on me. One of my theme songs about the men I seemed to encounter was You're So Vain by Carly Simon. (I have natal Chiron conjunct the Descendant.) Much of the music of the ‘70s echoed my angst in relationships and worries about the planet going to pot (not the kind you smoke). Then there was an entire album about what it was like for me to be female during this painful decade, Dory Previn’s Live at Carnegie Hall . Thankfully, I no longer resonate to these songs. (Not only is there hope for pain recovery; it would be interesting to track Chiron transits by musical taste.) Whatever anthem describes your suffering, you may find enormous comfort during a Chiron transit in someone’s words and music who has shared your grief. Just remember: You’re passing through. Pain is not your destination. If you find yourself getting stuck, call for help. A book my husband discovered when he was stuck in depression advises just that: When Going Through Hell... Don't Stop! A Survivor's Guide to Overcoming Anxiety and Clinical Depression by Douglas Bloch. (Douglas Bloch, by the way, has co-authored Astrology for Yourself: How to Understand And Interpret Your Own Birth Chart with Demetra George.) Meanwhile, sing along to the blues with the best of them. On the healing side of the musical equation, The Guardian’s Readers Recommend: Songs about Healing is a composite playlist created by those in need of psychological triage. Grammy.com put together a playlist in honor of nurse’s week, Songs for Healing. I have some wonderful New Age instrumentals on this topic in my own collection, but my all-time fave is The Healer’s Touch by Max Highstein. The original is only available in cassette, but he reworked it into a CD on the album Stars. It contains the two-part Healer’s Touch, and Stars is my other favorite track. Healing songs can be any song that makes you happy and ready to embrace life fully once more. I’d love to hear about the ones that do their mending magic for you. TV/Movies. Two come immediately to mind, the offbeat and oddly Chironic character Gregory House in House, M.D., can still be seen in reruns on the USA network and likely elsewhere in the world. As for movies, the original Star Wars was released in 1977, very close to Chiron’s discovery date. Chironic themes and beings permeate it, including one of my favorite Chironic characters, Yoda. Watch these when Chiron is transiting and simply absorb yourself in the stories. See what happens. Another gem, if you approach it lightheartedly and not as “serious literature” is Percy Jackson and the Olympians: The Lightning Thief. Chiron is a literal character, played by Pierce Brosnan, in this tale of how teenagers fare being half-breeds (theme obvious? ), children of mortal fathers and human mothers. All the outerplanetary Greek pantheon is there and a few other gods and goddesses to spare. It’s wacky in parts and offbeat. I loved it. Art. Insert "Chiron art" into your search engine or use this link to my Google search. Take some time to contemplate these amazing images of mythical Chiron expressed in various art media. Forget what you already know about Chiron for a moment. View the images and ask yourself, What do I see in Chiron? Next, ask yourself of those qualities you see, which are simpatico with you and which are not. Jot these down for further exploration, contemplation or possible journaling. If you find an image of Chiron you especially like, place it on your altar or somewhere you can see it often during your Chiron transit or when dealing with Chiron in your natal chart. How does it speak to you over time? Invoke Chiron’s healing kindness with A Prayer to Chiron. You might also enjoy A Native American Healing Prayer. Start here on The Radical Virgo by popping Chiron into the search box in the sidebar. There are dozens of articles on Chiron as the main topic and many more with Chiron as one topic among many. My Chiron primer, Chiron and Wholeness, is a five-star best seller in Kindle on Amazon and is also available in the sidebar in PDF. My newest Chiron book, Keywords to Unlock Chiron, also in PDF, can be purchase here, too. Let’s make the Thrival Kit a community effort! Thanks for sharing tools and ideas that have helped you through your Chiron transits and tensions in the Comments. There are more in Quotes for the Chiron Journey and Quotes for the Planets #1. If you’ve got quotes or short blurbs on healing concepts, thanks for sharing. NEXT: Thrival Kit for Uranus, Sept. 16.